So you’re creating an event website, and you’re looking for event website design examples for inspiration and guidance. You’re also wondering which website platform is best to use for your event website. But before we dive into examples of what event websites look like in the wild on a variety of website builders and hosting platforms, there is one thing to keep in mind when you’re evaluating a website: it’s not just about how the websites look. The functionality matters too. Looking at a event website examples should be done in the same way. We collected the following event website examples not just to show you how they look on different platforms, but how they can function, so you can be sure you create a website that fits both the look and functionality you need! We’ve pulled these examples based on functionality, design, and usability. Again, when you’re looking to build an event website, remember that you’re not just thinking about making the site look good. You want to think about what your site actually needs to do, and find a platform that supports all of your needs. What stands out about Bonnaroo’s site is how much the design captures the essence and atmosphere of the festival. It’s creative, loud, and a bit in your face (in a fun and playful way). In terms of functionality, this event website also has all of their bases covered. You can buy tickets, see event details, explore the lineup, and even ask their help bot a question. We especially liked how easy the website is to use. Even though there’s a lot of content packed into the site, the navigation is straightforward, and we didn’t have to spend time digging to find what we needed. On the other side of the spectrum is this local events website for an Atlanta art festival. What we liked about this site is the simplicity. The design is straightforward, but it still includes all of the information you need about the festival (including built-in map functionality!). It just goes to show that your event website doesn’t have to be some masterful designed site… it can be simple and straightforward and still get the job done. Atlanta Sport and Social club is a really interesting example of an event website that uses a niche software provider (League Lab) to get very specific functionality. Take a look at their Schedule and Standings page. You can filter by spot, date, location, and even neighborhood! They also integrate social events, corporate events, and photos. This is a great example of building a website that requires very specific functions for your niche. Remember that your event website isn’t just about what it looks like… it’s about what it does. Another type of event website? Weddings! Mary and Bill’s wedding website is a great example of how a simple event theme can be transformed into a fun, personalized website without having to custom-build something complex. Their “getting there” page has a cool designed map image, directions, and fun fonts and colors — all elements that make their website unique to them without having to spend money on a custom designed website that you’ll only update for a year or two. While technically The Mirage is more than an event website (it’s primarily a hotel website), it does serve as a great example of a site that needs extensive event functionality. We particularly liked how this event website example uses a card layout to display upcoming events directly on the homepage. Each card has its own call to action (like buy tickets), so it’s really easy for site visitors to see what’s coming up and then take immediate action on the events they want to attend. It’s simple, but incredibly user-friendly. If you’re looking for an event website that can display information for multiple events (i.e. several conference dates), Digital Summit’s website is a great example to use for inspiration. Notice how clear the navigation is — you can either view all events, or you can download resources (another great piece of functionality if you have educational materials to go with your event). Plus, the design is clean and polished, which is right on par with the audience they’re attracting. 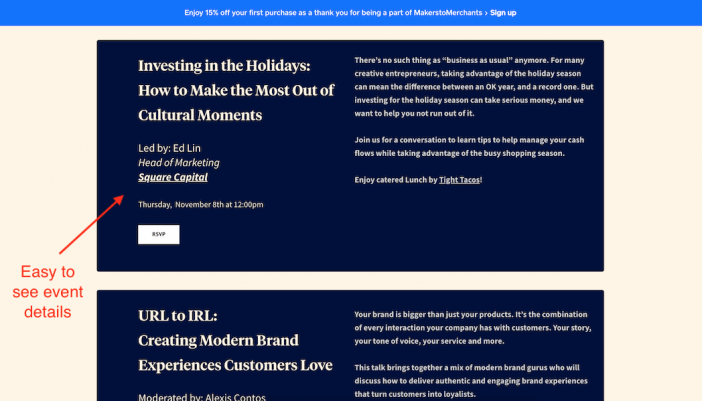 Makers to Merchants is another solid example of an organization that uses a single website to promote several events. This event website uses dynamic elements (like a video header) to add some advanced design and functionality to the site. Notice how this site implements photos from previous events to give readers a feel for what to expect. The design is straightforward, and the list of events makes it easy to see what’s coming up and RSVP quickly. All in all, this is a great example of a straightforward event website that gives readers all of the details they need, as well as a behind-the-scenes look at what the events look like! Now that you have some inspiration in terms of the design, colors, and functionality you may want in your event website, where do you go from here? Well, it really depends on where you are in your event website building journey! If you’re ready to decide on a website builder, check out my guide to choosing a website builder here. If you’re looking to go DIY with a specific template to match your design and functionality needs, check out my Build an Event Website: Templates, Design, and Setup Guide. Lastly, if you’re wondering how to market your event website, check out my guide to creating a local marketing strategy! The post 7+ Best Event Website Design Examples for Inspiration appeared first on ShivarWeb. So you’re considering using Weebly as your website builder, and you’re looking for Weebly website examples for inspiration and confirmation that you’re making the right choice. Weebly is an all-in-one “hosted website platform.” A hosted website platform is where all the components needed for a website come in a single bundle with a single monthly price. Weebly provides the software to manage your website content; they provide the designs and functionality. They provide add-ons & extensions for unique functionality. And most importantly, they also provide the hosting (aka the server where your website files live) & security all in one price. Essentially, using Weebly is like renting an apartment. You can customize the inside, but you don’t have as much freedom as owning a condo or a home. But before we dive into examples of what Weebly websites look like in the wild, there is one thing to keep in mind when you’re evaluating a website platform: it’s not just about how the websites look. The functionality matters too. Looking at a website platform should be done in the same way. We collected the following Weebly examples not just to show you how they look, but how Weebly websites can function so you can be sure you have a website that fits both the style you want and the functionality you need. Double Arrow Veterinary Clinic’s website is a great example of using a basic website template to get the job done. Visitors can immediately book an appointment, the navigation at the top is clear and concise, and the important information bar puts all of the must-know info front and center. If you’re looking for an easy website that allows you to provide crucial information, this template is a great example. Pueblo Dental Surgery’s website is a great example of a solid, straightforward website. The navigation is clear, the homepage includes an introduction with copy that describes what the center is all about, and the video is a great touch for visitors to dive deeper into learning about their services. If you’re looking for a basic website where you can plug in your services + information, this is a good example to use for inspiration. Forbes and Don’s wedding website is a great example of how a simple template can look polished and elegant without having to custom-build something complex. Their fonts, black and white photography, and fun copy (check out how they met!) gives the traditional template added personality. Remember, a wedding website has a relatively short lifespan. What you’re looking for is something you can easily customize and add content to without spending a ton of time (or money!). What makes this Weebly website a great example for photographers is the layout. The simple grid pattern centered on the page immediately draws visitors’ eyes to Alex’s work. If you want to explore a piece further, you can hover over the image to get the story, or click to see the larger photo and read the caption. Alex has given visitors an easy way to view his work in a way that’s sleek, visually coherent across the board, and is easy-to-use — all hallmarks of a great website. This Weebly website is another example of a great layout for photographers. The use of the carousel of images on the homepage (with the smaller versions underneath) gives the website a unique interactive feel without overloading the functionality or taking the visitors’ attention away from the work itself. If you’re looking for a way to include some interactivity on your site without sacrificing user experience, this is a great way to do it. A great ecommerce website comes down to a few main things: high quality product photos, easy navigation, and easy check out. This website from The Box Bros checks all of those boxes. We particularly liked the product page, where the main focus is on the product images themselves. To get more info, users just have to hover over the image to see the name and price range. Start Cleaner’s website stands out for a two main reasons. First, the header section includes all of the crucial information you need — the product name, what it does, and a discount code you can use when you “buy now”. The navigation is also clear and concise, and the banner at the top that broadcasts free shipping adds a nice value proposition. Second, the chat with us bar in the bottom right hand corner of the page adds a layer of customer service that’s perfect for ecommerce sites. It gives shoppers an easy way to ask questions or get in touch if there’s an issue. Wendy’s website stood out to us for a few reasons. First, the use of her illustration in the header is a great example of how to implement creativity on your Weebly artist website without having to create something incredibly complex or custom-built. Sometimes, a touch of uniqueness goes a long way. We also enjoyed the sketch book page of her site. It’s a fun to showcase pieces that perhaps don’t fit with her main work, and a great example of how navigation / website structure doesn’t always have to be your usual “about“, “portfolio“, “contact” pages (just remember not to sacrifice clarity for creativity). Boyante’s website is a great example of keeping the focus solely on the music. Their navigation gives visitors clear directions on how to learn more about them, hear their songs, and buy their music. The social media icons in the top right corner are also a great touch. Further down the page, the site includes a music player combined with a simple about section. The combination of the player and the text is a great way for visitors to listen to the songs while also reading about the band, and the Spotify Follow button is a great way to move fans to their Spotify channel, where they can stay connected to their music and new releases. E.S. Johnson Builders is a great example of a sleek and professional business website that checks all of the boxes: it’s easy to navigate, showcases work and services, and has contact information clearly displayed and easily accessible. We particularly liked the slider at the top of the homepage, which visitors multiple navigation options, like see available homes and view current projects (both essential for homebuyers who want a custom-build). We also found that the Services section further down the homepage, where they feature a breakdown of their services with buttons to dive deeper into each, was a great way to add another layer of navigation to homepage without making it muddled or confusing. FocusStage is another great example of a sleek business website that hits all the marks for great user experience, clarity of communication on what the business is about and how they can help you, and ease to contact. One of the elements that stood out to us was the video header on the homepage, which adds dimension without complication. We also liked the breakdown of the FocusStage process — it’s a great way to show visitors what it’s like to work with this financial firm. Oftentimes, people get so focused on design that they tend to forget that what really matters on a personal website is, well, you. Dave’s site is a great example of how you can build your personal brand and showcase your work without a ton of flair (in fact, great copy will do the trick). If you’re looking for a simple layout that gives you the opportunity to tell everyone what you’re all about, this one will do the trick. At the end of the day, choosing your website platform goes far beyond design. Why? Because all web pages are made of HTML & CSS with a few scripts thrown in. This means that any website template can exist on any good web platform. If you feel like Weebly fits the design and functionality needs you have for your website, you can explore more Weebly templates here. Not sure if Weebly is a right fit? Explore other Weebly alternatives here. TK nate links needed above! The post 11+ Weebly Website Examples for Inspiration appeared first on ShivarWeb. When Should Someone Not Use WordPress? You’re probably here because you’ve heard the buzz about WordPress (Alignable’s SMB Index says WordPress is the most trusted software for small business), but are wondering if there are situations in which someone should not use WordPress for their business website. WordPress is an incredibly versatile website platform — I won’t hide my enthusiasm for it. But there is no such thing as a “best website platform”. There’s only the best choice based on your goals, resources and preferences. Most website platforms promote with features and price. But like buying a house – price and features don’t tell the whole story. They don’t tell you if this platform is a good choice for your website. When evaluating whether or not to use WordPress, you need to think about your needs for a website. Do you need flexibility? Support? A mixture of both? Disclosure – I receive referral fees from companies mentioned on this website. All data & opinions are based on my professional judgements as a paying customer or consultant to a paying customer. Before we dive into the no-WordPress scenarios, it’s important to understand how we’re approaching deciding on a website platform. Think of it like shopping for a house. You should be evaluating your website provider based on what you want, what you need, and what tradeoffs you are willing to make. When it comes to your website platform, the main trade-off is between maximum convenience and maximum control. Think of it this like buying somewhere to live. The absolute most convenient place is a hotel room. It’s safe and furnished with room service. But can you repaint the room? Nope. On the other extreme is raw land. You have unlimited control to do whatever you want. But is it convenient? Nope. And in the middle, you have a mix. An apartment has some freedom – but you have landlord. A condo has even more freedom… but you have a HOA and shared property. A house has even more freedom… but you have more responsibility and you have to deal with an existing building. Using this analogy, WordPress is like owning a house. You don’t have as much control as you would if you just bought raw land and built something yourself, but you have way more control than say, an apartment or condo. WordPress’s primary structure is pages, posts, and comments. While the platform does use Plugins (where you can download and “plug-in” third-party pieces of software to make your site look, act, and feel exactly the way you want) that allow the CMS to be turned into literally anything, you should still be operating within the realm of pages/posts/comments if you want to use WordPress. If you’re looking to build a non-CMS website (think Software as a Service or mega-robust ecommerce platform), then you’re better off building a custom solution. Why? Because something ultra-specific like the examples above typically require 100% control. Loading up your WordPress site with hundreds of Plugins just to make it close to what you want is just going to slow it down. This is your raw land example — it’d be easier to build your dream home from scratch than try to manipulate the house you already have or add on a bunch of attachments (Plugins) that may mess with the wiring/airflow/other elements of the home. If you’re looking for some customization abilities on your website but don’t want to deal with the more “technical” aspects of managing a website such as self hosting, check out customizations for ecommerce, server management, etc. then a self-hosted WordPress isn’t the best option. There are two different routes you could go if you want more customization without having to handle controlling the technical aspects of your site. The first is what I’ll call the 70% Convenience // 30% Control group. These are providers that allow for more control than a totally done-for-you platform (like Amazon, where you have zero customization), but you’re still using their space and rules (in our house analogy, these are the apartments). These are usually “website builders” like Wix (I reviewed Wix here and you can check out Squarespace here) and Weebly (I reviewed Weebly here. You can check out Weebly here…). They allow you to customize your website and have a custom domain, but the remaining technical elements (like ecommerce integration) are handled for you. The second group is 50% Convenience // 50% Control. They’re known as hosted platforms and provide as much control as you can have before you have to have your own server. The biggest advantage here is that you have customer support, seamless “onboarding” and advanced tools. Building a website with these providers is like owning a condominium or leasing a storefront in a mall. The plumbing and “big stuff” is taken care of. You can pretty much do what you want since you do fully own your property. However, you’re going to run into condo association rules and fees. This would be a provider like WordPress.com which is a hosted version of WordPress or a self-hosted WordPress page builder like BoldGrid. They limit some of what you can and can’t do. For example, you don’t have FTP access to a server, but you can access your HTML/CSS editing and use 3rd party plugins with their business plan. You can also export your data and migrate it to self-hosted WordPress or another platform with relative ease, making it a good in-between if you want to start with more convenience and migrate to more control in the future. WordPress comes with a learning curve. But given the platform owns 50-60% of the global CMS market share, there are thousands and thousands of pre-made templates, plus designers and developers who know WordPress and are ready to help your firm. That being said, the trade-off here is time and/or resources. Either you have to take the time to learn the basics of WordPress and keep the software updated like you do the apps on your phone, or you have to know enough to vet these support roles to make sure you’re getting the results you need at a reasonable price. Not all projects justify this trade-off. A simple website that doesn’t need any advanced functionality or the ability to scale would work perfectly fine as a simple HTML site and may cost you less in time/resources than learning WordPress or hiring a designer and developer to build your WordPress site. The flip side of having no time and resources is having all the time and/or resources. This goes back to our first scenario… if you have a team of people and the funds to build and maintain your website for you, you can build whatever you want, including a totally custom website that’s unique to your business and the functionality you need. With that said, this scenario comes with one big caveat: you’re putting your website in someone else’s control. If you’re comfortable with putting your website 100% in the hands of someone else, go for it. If not, then you may want to rethink a custom build and brush up on your website management knowledge. WordPress is like the mid-size SUV of the website building world. It doesn’t fit everyone by any means, but there also good reason that a large plurality has one. I’ve tried to make it as easy as possible to try WordPress before making any decisions here. If you don’t have time to run software updates and learn a bit of WordPress jargon, then you should go ahead and pay the extra money for an all-inclusive website builder. Sure, you’re trading control for convenience, but that’s fine. On the flip side, if you’re very adept at working with developers or have the money to pay for custom builds and don’t mind putting your site into someone else’s hands, then you’d want to research more – especially in regards to ecommerce. WordPress may not be the right fit for you. You can check out some interesting WordPress alternatives here. Finally, if you’re building something super, super simple, then WordPress may simply be too complex for what you’re looking for. You might just need some cheap hosting or even a simple profile on an existing platform. The post When Should Someone Not Use WordPress? appeared first on ShivarWeb. So your website is a mess — where do you even begin to “fix” it? What does “fixing” it really mean, anyways? If you’re looking to improve your website, you know how daunting this overhaul can be. There are tips and tricks for almost every facet of the process, from improving your copy to reworking your design. What you need is a process — not a grab bag of tips that leave you more confused than when you started. Here’s the 7-step framework you can follow to improve your website content, even if you have no idea where to start. It may sound basic, but before you change anything on your website, you need to understand what your website does. You can have the most amazing site in the world, but if you don’t know what you want it to achieve, you’ll never really improve. The first step is pretty straightforward — you need to define the goal for every single page on your website. Each site page has a unique objective. For example, your homepage should encourage visitors to explore deeper into your site, a blog post may be key to generating new traffic, and a product page necessary for sales. By understanding each page’s goal, you can begin to understand where things may be breaking down. Start by putting your website into a map. List all of the pages you currently have, then define the goal for each page. Once you have your page objectives down, it’s time to look at how your website fits together. Think of your site like a puzzle. Each individual page is a piece of a larger picture. The pages all work together to create one big image (which is your user experience). Your website’s organization should be intuitive for someone who is trying to navigate it. You don’t want a visitor to arrive at your homepage and be stranded, nor do you want them getting lost. Imagine how frustrating it is when you’re on a website and can’t get to the information you’re searching for. Use your map to organize your website’s flow. Which pages are subpages of a larger section? Which pages need links to others? Note those in the spreadsheet, or use indentations to show how they connect. Understanding your users is marketing 101, but it’s crucial for creating a website that achieves your goals. If you have the most amazing website, but it’s not tailored to the type of visitors you want and need, what good is it? Before you rework your website, you need to understand who your audience is. Are they CEOs of small businesses? Are they local companies? Who are they, and what problems do they have? How are you helping them solve these problems? Create a persona for your website users. A “persona” is marketing jargon for a profile of who you are really trying to do business with. Write out one that describes your ideal customer. Be as descriptive as possible by including things like job title, favorite device, payscale, main frustrations and problems, end goals, what they do in their spare time, etc. Use Moz’s guide to user personas to guide you through the process. One of the best parts about the internet today is nearly everything is recorded. This means you have access to an incredible amount of data that can paint the picture of why your website isn’t working. Once you know who your audience is, it’s time to dive deeper into how they’re experiencing your website right now. Google has one of the most intuitive platforms for work like this. Take some time to use Google Analytics to figure out where your audience is getting hung up on your navigation. Look especially at the Behavior Flow section to see where users are dropping off. Create a column in your spreadsheet dedicated solely to “optimizations”. Use your data to evaluate each existing page and note any breakdowns or opportunities. For example, are you noticing a high drop off on a page that’s bringing in significant traffic? Write it down next to that page. Keyword and topical research are crucial to understanding your audience’s interests and how they search online. By implementing the same sort of language your audience uses while searching the web, your site will not only perform better organically, but will resonate with your target audience and remain relevant. For your existing content, you can use Google Search Console to see where you can optimize pages that already have some visibility for specific search terms. Use it to determine where you can adjust a page to capture more organic traffic, expand on a certain topic, or update outdated content. It will also flag HTML issues such as duplicate content and titles and meta descriptions that need improvement. You can get the full guide to using Google Search Console here. But what about the pages that aren’t already getting traction? For those, you’ll want to do additional keyword and topical research. I’ve put together a step-by-step process to using keywords on your site, which you can use to walk through the process of finding and implementing user language on your site. As you go through the research process, create a keyword map for your entire website to add words and topics for each page. You can add it to your existing spreadsheet so all of your information is in one place. You can’t improve what doesn’t exist, Once you have a handle on what’s going on with your existing content, it’s time to dive into what’s missing from your website. From a user’s perspective, what’s missing? Start by doing internal research. If you have a sales or customer service team, ask them what questions they’re getting. More importantly, look at your own internal site searches! This tells you exactly what people are searching for on your site (because they can’t find it). Also comb through your email and see what people ask when they contact you about your business. Chances are, those questions are missing information on your website, and you can add them either as a new page or as an FAQ page. After you’ve taken a look at your own internal sources, it’s time to take a look at outside data. Use tools like Ahrefs to help you find what industry publications and competitors are getting right (use the full guide to Ahrefs to help you get the most out of the tool). Look especially for content with significant backlinks and organic traffic to see what type of content is in tune with your target audience. Then, add the missing pages and their corresponding keywords/topics to your website spreadsheet/map. Improving your website isn’t just about improving the content — it’s also about improving the experience visitors have on your site (also known as user experience). You can have all of the right information, but if the website is slow, looks funky on their mobile device, or has a horrible design… you can bet users aren’t going to stick around. There’s so much that can create a poor user experience — a bad design, broken links, a slow page load speed — it’s your job to find these negative elements and remedy them. Start by evaluating your website design. Do you have a cohesive color palette? Are your images high quality? Does your website scale for tablet and mobile devices (also known as responsive in web jargon)? The visual appeal is going to be key in keeping users enticed and engaging with your content. Next, dive into the mechanics. Start by testing page speed with Google’s PageSpeed Insights tool. If you’re seeing low or below average speeds, use this beginner’s guide to increase page speed to help fix it. Make sure you use correct HTML formatting. Make sure your design values function over form (don’t use trendy bullsh*t like Parallax unless you value design awards over sales). You’ll also want to check for broken links. To make sure none of your internal links are rendering a 404 page, use Screaming Frog to do a scan of your site’s pages. If you are specifically looking for Googlebot 404s, you can check your Search Console report. Now that you’ve addressed the mechanics and make-up of your site, it’s time to focus on the flair — otherwise known as the actual copy on your website. As with all the of the elements in this guide, good copywriting (when combined with other website best practices) can lead to more traffic, better leads, and more sales. Take a look at each page and determine where your content can be spruced up. Where can you use images instead of text? Where can you add more of your brand personality? Where can you break up paragraphs so the page is easier to skim? Use this guide on how to improve website copy to help you evaluate your site copy. Choose three areas where you can improve, then go implement it! Improving your website content can be a daunting task with no clear starting point. Using a grab bag of tips and tricks doesn’t get you any further — in fact, it can leave you feeling lost. Instead of hopping around and fixing things at random, put a plan in place that takes you through each phase of the process in a methodical manner. Use the steps above to help guide you, and make sure you focus one one step at a time. By following a plan and sticking to the process, you’ll be well on your way to overhauling your website to create one that helps grow your business (without feeling completely overwhelmed!). The post How to Improve Your Website Content appeared first on ShivarWeb. A visitor has taken some sort of action on your site… hurray! Before you celebrate too much, let’s talk about your Thank You page. The Thank You page is one of the most underrated pages on a website. We often focus so much on getting someone to take an action (like purchasing a product, signing up for a webinar, downloading a whitepaper) that we forget how valuable a Thank You page can be, or the effort we should put into it. A Thank You page, when used correctly, can be a crucial part of nurturing your audience. But before we dive into some best practices, let’s cover the basics. A Thank You page is where a visitor is taken after completing a desired action on your website. It’s also sometimes referred to as a “confirmation” page because it confirms an action was taken. A Thank You page can follow up any desired action on your site, from filling out a contact form to subscribing to an email newsletter or purchasing a product on your site. Do I Need a Thank You Page? If you have some sort of action you want visitors to take (also known as a “conversion” in marketing speak), then you absolutely need a Thank You page on your website. This page not only serves as a way to confirm the action was taken successfully, but it also allows you to continue to engage your visitors, especially while they’re still “warm” (sales jargon for they’re more likely to want to interact/do business with you). A visitor who has just taken an action on your site is incredibly valuable because they’re indicating they’re interested in you and what you have to offer. An effective Thank You page is a way to further that relationship and keep that interest growing. Plus, saying thank you after your audience does something on your site is just plain polite. A lot of forms and landing pages include built-in functionality to display a confirmation message once an action is completed. This functionality generally keeps users on the same page and simply replaces the form/download button/purchase area with a thank you message. While showing this message is enough to confirm the action, in most cases, it doesn’t do much for continuing to engage with your audience. This is where a dedicated Thank You page can do wonders for your post-conversion opportunities. By leveraging an individual page instead of a message on the existing page, you have more flexibility and opportunities to increase engagement, share relevant content, and provide additional opportunities to convert. For more about thank you pages vs. thank you messages, check out this article by Hubspot. Now that we’ve covered the basics, let’s dive into the details. Here are seven Thank You page best practices you can implement on your own site. Your Thank You page should also confirm any relevant details relating to the conversion, such as how long it will take you to respond after they’ve filled out a contact form, or when they can expect to receive the whitepaper they’ve opted-in for. Remember, this is someone who has indicated interest in your business. You want them to feel valued right off the bat and to know that the action they took actually worked. The best way to do that is to confirm all of the details as soon as they finish the conversion. One of the worst things you can do on your Thank You page is keep your audience stranded there. These are people who have just indicated they’re into what you have to offer, which means this is the perfect time to keep them hanging around your site! At the very least, your Thank You page should include your website’s navigation to allow your audience to stick around and explore your site some more. Aside from using your navigation to give your audience an opportunity to stick around, your Thank You page is also a great place to provide related content or additional actions your lead may find interesting. For example, if they’ve just opted-in to a whitepaper, you could provide related content on the same or a similar subject. This is a great way to continue to “warm up” your visitors (AKA make their interest in you grow) without being overly sales-y. You could also use this opportunity to lead your users further “down the funnel” (the next step closer to purchasing) by offering another relevant action. For example, Hubspot offers a free session to learn more about their software after you opt-in to download one of their guides. If your Thank You page shows when a visitor has already taken a purchasing action, you can still use related content to keep them engaged. The easiest way to do so is to display related items they may also be interested in — Amazon is renowned for doing just that! Did a customer just enter to win a free product? Why not offer a coupon code to encourage them to purchase something sooner? Adding an offer or promotion can be an excellent way to encourage warm visitors to convert, or to increase the value of a converting customer by enticing them to purchase additional items. Keep in mind that your offer should be something relevant to their action and worthy of their attention. You don’t want to come across as spammy over overly sales-y. You want to provide something that feels uniquely valuable to your audience and relates to whatever action they just took. Encouraging people to connect with you on social media is a great way to further connect with a warm audience. Instead of just leaving links to your social profiles, take it a step further and tell visitors why they should follow you. What can they expect to see if on they follow you? News about your business? Tips and tricks related to the action they just took? Spell out the value and make it clear it’s worth it. You can also use your Thank You page as an opportunity to spread the word about your business. This works particularly well for actions like webinar registrations and offer redemptions. If your Thank You page is confirming an offer redemption or webinar sign-up, include social share buttons to encourage your converters to spread the word on social media with their friends. They obviously think what you have to offer is worth signing up for! There’s a good chance they’ll spread the word for you, too. Even if your visitor has just completed a purchase, your Thank You page can still be a place of reassurance that you’re as great as you say you are. Use your page as an opportunity to show off social proof, whether it be customer testimonials, the number of social media fans you have, or a quick stat or case study. Your Thank You page should continue to warm your visitors and encourage them either to purchase down the road or to purchase again. Using social proof to help reassure them that you’re the real deal can help this process significantly. A Thank You page is the perfect time to ask your audience to become a regular part of your community and an ongoing converter. For e-commerce businesses, asking your purchases to create an account after converting can yield far more results than asking prior to purchase (and can reduce cart abandonment). If your business doesn’t include the opportunity for customers to create accounts, you can still invite converters to be regulars by asking them to opt-in to your email newsletter on your Thank You page. Make sure you specify why your audience would want to subscribe to your newsletter — what is it you’ll be offering that makes it worthwhile? Your Thank You page can be an amazing tool in your sales arsenal if used correctly. Don’t let all of your focus go toward the conversion — spend adequate time on your confirmation page and yield the benefits time and time again. Start by taking a look at your own Thank You page. Does it confirm the action your visitor took? Does it offer opportunities to stay engaged with your business? If it doesn’t, start by introducing one way for users to continue to interact with you. Remember, like all pages on your website, your Thank You page isn’t set in stone. Test one approach to adding some meat to your page (like adding related content or a call-to-action to follow you on social media) and see how it works. Then, adapt! It’s frustrating, but it’s also a part of life on the web. Mistakes will be made, and error messages will be seen. But it doesn’t have to be all doom and gloom. In fact, you can turn your website’s error page (also known as a 404 or Page Not Found error) into a positive experience for your visitors. But before we get there, let’s cover a few of the basics. A 404 is the error page your server shows when it cannot find the page someone is looking for on your site. It is also known as a Page Not Found error, because it is shown when a specific page within a live website cannot be found (if the entire website were down, a different error would show). 4o4 pages are usually shown when someone mistypes a web address, or if a page has been taken down and a redirect to a different page has not been set up. A 404 error page is actually a necessity, because it lets a user know that whatever they’re looking for cannot be found. And while a 404 page isn’t necessarily a bad thing, it shouldn’t be caused by your own internal links. This means that whenever you link to another page on your site, you should always be pointing to an actual page — not a “page not found” error code. To make sure none of your internal links are rendering a 404 page, use Screaming Frog to do a scan of your site’s pages. You can also use the Chrome browser extension, Check My Links, to do a quick scan of the page you’re currently on. If you are specifically looking for Googlebot 404s, you can check your Search Console report. But even if you have all of your ducks in a row when it comes to internal links, your website visitors are human. There’s always a chance of a URL typo that will bring up your 404 page. There’s also the possibility that others who link to your site may link to an outdated page that does not have a redirect, or may type the URL incorrectly, which will also render a 404 error. As such, it’s important to have a page that clearly communicates the error and provides a good user experience (more on that in a minute). Like anything on your website, the decision to implement a redirect (when you automatically send a user to a new page when they type in an old URL) or to show a 404 error page isn’t black and white. It all depends on user experience. Let’s say you have a page that ranks high in search engines and includes a ton of external links to it. For some reason, you take it down. In this case, you’d probably want to create a redirect to something similar and reach out to the external linkers to get the links replaced with the new content. In other cases, it may be better to use a 404 page because it clearly shows users the information that they’re expecting to see doesn’t exist. For example, if you expect to land on a blog post about the best dog toys for large dogs, but end up on the brand’s product page for dog toys instead, you’d probably be a bit confused (and maybe even frustrated). Now that we’ve covered the basics, let’s dive into some 404 page best practices that you should be using on your own site. Have you ever landed on an error page full of technical jargon like “Internal server error” or “File or directory not found”? Don’t make the same mistake on your 404 page. While a lot of error pages come with standard 404 messaging like “page not found” or “there’s been an error”, take the extra step to make sure the copy on the page is rid of technical website jargon and explains what went wrong. Remember that a lot of searches aren’t even aware of what a 404 error is, which means it’s on you to break down what’s happening when they hit the error page. Out of the box 404 pages are rarely a thing of beauty. And while your page doesn’t need to be masterfully designed, it should fit in with your overall website design and brand voice. To make sure it does, put some sort of branding on the page (or at least make sure your site navigation and logo appear at the top). You’ll also want to be sure that any additional elements on the page (like photos, colors, and fonts) fit with your site’s color palette. When it comes to the actual copy on the page, keep it warm and welcoming. A 404 error shouldn’t be a disaster, and your copy should make that clear. You’ll also want the copy to match with your overall vibe (i.e. if you’re cheeky on the rest of your site, be cheeky here). The last thing you want someone to do when they land on your 404 page is hit the back button. Unfortunately, this happens all the time. Why? Because there’s nowhere to go! Take this error from Bank of America. There’s no action to take but to reload the page or head back to wherever you were before this page. Don’t fall into this trap. Make sure your 404 page invites people to go somewhere else on your site. A standard practice is to leave a link to the homepage at the very least, so users can navigate to the start of your site. It can also be good to include a search bar so users can search for exactly what they were looking for when they initially landed here. You want to give users an option of where to go from your 404 page — but this doesn’t mean dump every link you have on them and make them choose without any context. To ensure your 404 page provides a good user experience, limit the links on the page to a few key ones, like your homepage and contact page. No matter which links you choose, make sure you include the homepage for those users who aren’t totally sure what they’re looking for yet. A great 404 page can be the opportunity to change a visitor’s feeling about their whole experience with you. You can take a user from frustrated to satisfied just by using a bit of creativity on your page. One of the easiest ways to do this is to weave a bit of humor into it. Take this clever 404 page from LEGO, which uses Legos to convey the error. They do a great job of adding a touch of creativity with their copy while still keeping things professional. This 404 page from Bloomberg animates a businessman destroying his computer and then combusting. The clever use of animation and humor make landing on this error page actually worth it! You don’t have to be a creative genius to have a good 404 page. Sometimes simple is better. We like LinkedIn’s because it’s straightforward. The moving telescope is a nice touch, too. NPR does a great job of giving the user the right number of options for a next step and adding a bit of humor with their stories about lost people, places, and things. Bonus points for adding a place to report the page as missing . This is a great way to make sure they’re accounting for non-user errors. There’s always a chance of someone getting a 404 error on your website — it’s up to you to make the experience a good one. Remember that your 404 page has the opportunity to change a user’s experience with you. It’s an excellent opportunity to take a frustrated visitor and turn them into a fan of your business. At the very least, a good 404 page clearly explains the error, why it might be happening, and gives visitors a path to follow to continue interacting with the rest of the website. To take your page up a notch, try weaving in some of your brand personality a bit more. Play with creativity and humor (if appropriate). You never know when a good 404 page can turn someone into a brand advocate or loyal customer. Ah, the homepage. If you’re like most website owners, you’ve put massive thought into making your front page look amazing. But there’s a rhyme and reason behind homepage design… at least, there should be. Your homepage likely attracts the most visitors of any page on your site. It’s the front door to the rest of your content — and the rest of your business online. Think about your own browsing habits. What happens when you have a bad homepage experience on someone’s website? You likely hit the back button ASAP. So let’s talk about getting your homepage where it needs to be. Here are five homepage best practices you should follow, from how your copy should be written to how to give visitors next steps (with examples)! For many (but certainly not most) visitors, your homepage is their very first interaction with you. This means it needs to answer these two questions immediately: Who are you and what do you do? There should be no doubt in a visitor’s mind that they’re in the right place when they hit your homepage. If they can’t identify who you are and what you have to offer in a matter of seconds, they’re going to bounce (and probably head to your competitors). There’s no point in dropping tons of bucks to design a homepage if it doesn’t resonate with your target audience — no matter how beautiful it is. Your homepage should be all about your users, which means it needs to read the way they speak and have a design that gives off the right perceptions about your brand. Keep your copy clean, straightforward, and rid of jargon that could confuse your audience. You’ll also want to make sure your design is clean, offers a great user experience, and gives off the emotions you want associated with your business. For example, a bank may want to have a more professional feel and use colors that portray trust and reliability (like blue). In contrast, a doggy daycare may want to be more playful and fun and use bright colors, creative fonts, and animations. While your homepage is a huge source of new traffic, most of the time your homepage visitors come to your site knowing what they’re looking for. Why not give it to them in as simple a way as possible? Your website’s navigation should be clearly visible at the top of your homepage and have logical paths to guide users to the next step. You can also include a website search, which gives users direct access to exactly what they’re looking for without having to click through multiple pages (this can be especially handy for ecommerce businesses who have tons of products). It’s not enough to have a homepage that looks great on a desktop. In today’s day and age, your website must be optimized for every type of device. A 2016 study by Hitwise saw mobile search made up approximately 58% of search queries — which means a significant portion of your traffic is coming from mobile devices. But optimizing your homepage for mobile means more than just making sure your design fits the screen dimensions — it means the entire experience needs to be user-friendly for mobile users. Your mobile homepage should be rid of anything that makes it cumbersome to navigate and use your site (like annoying pop-ups that are hard to close on a small screen). It should also load quickly and feature clear and simple navigation. If users get stuck on your homepage, it’s not doing its job. The page should be logical — which means it should have primary and secondary calls-to-action (CTAs) that help your users take the best next step depending on what they came to do. Your primary CTA (the main action you want users to take) should be “above the fold”, which is designer jargon for “above where the page cuts off and a user has to scroll down”. Your secondary CTAs can sit lower on the page. Keep in mind that while you don’t want users hanging out on your homepage forever, that doesn’t mean you should go into CTA overload. Stick to a few actions that your audience may want to take and make sure you cover all stages of someone’s “journey” with you (i.e. have an action for those who are ready to convert, and one for those who are simply looking to learn more about you). The Milwaukee Ballet homepage immediately catches the eye with a beautiful video of dancers performing. The entire homepage hero slideshow is video, but it doesn’t overwhelm. In fact, it hits just the right vibe a ballet-lover would love: elegant, sophisticated, and fluid. But perhaps the best part of this homepage is that the user experience doesn’t take a backseat to the design. The navigation is easy to find and use (search bar included), and the CTAs over the video slideshow are logical and clear. KIND Snacks gets full marks for its amazing tagline and value proposition. A visitor immediately understands what sets KIND apart as soon as they land on the homepage. Plus, the use of contrasting colors makes the whole page pop and immediately draws your eye to the product photo and tagline. Speaking of product photos… the KIND bar photo and secondary CTA photos are the level of quality homepage designers should be looking for. They do a great job of making the snacks look ultra-appealing. Remember that your homepage doesn’t need to be all things for your website. In fact, it needs to be one thing — the gateway to the rest of your site. Sometimes this means less is more, as is the case with Lululemon. This minimalist homepage balances bold photos and colors with a clean design and straightforward navigation. There’s no doubt about what actions a user with a specific goal should take. Lululemon covers everything from trends, to different clothing categories, to gifts. They also do a great job of throwing in a value proposition at the top of their site to help reassure uncertain buyers: free shipping and free returns. A great homepage draws in visitors and then keeps them on your site. This means the focus of your homepage shouldn’t be just a cool design — it should be on clearly communicating your value and next steps to your audience. But keep in mind your homepage isn’t set in stone. In fact, it shouldn’t be! Your homepage should always be fresh to keep users engaged. To be sure your homepage is delivering, keep an eye on how your it performs in Analytics. Look especially at the Bounce Rate to determine if people are leaving immediately after landing there. If the bounce rate is high, it could mean visitors can’t find what they’re looking for, or you haven’t sold them on your value proposition. Most importantly, be flexible! If you think something isn’t working, hop in there and fix it. In fact, try that now. Head over to your homepage and identify one thing you could change, and do it. If there’s one page that’s accountable for the greatest effect on a company, it’s the merchandise page for e-commerce shops. Being an e-commerce store, you’re only as effective as the product pages. These pages can really do or die a purchase, and could be the main difference involving the store thriving on the internet and tanking. With this said… why is a good product page? Listed here are eight guidelines to make use of in your product pages to make sure they’re obtaining the task finished. When customers buy online, it normally won’t possess the luxury of having the ability to the touch and hold your product or service — meaning high-quality product images are mandatory in your product page. But it isn’t just the caliber of the image… the image size can impact profits. Apart from high-quality images, video may also be an amazing tool inside your product page toolbox. Inside a study by Stacksandstacks.com, visitors who viewed video on the product page were 144% more prone to give a product for their cart. With this stated, video isn’t essential-have for each online business. For instance, if you are selling men’s ties, a relevant video isn’t essential to observe how the tie looks on the model. Rather, you’d wish to depend on the nice zoom feature to focus on the facts of the ties. While product images are very important for your product page design, product descriptions are essential. A properly-written, informative description of product can produce a purchase. While it’s tempting to chop and paste your products descriptions across similar products, this creates a terrible consumer experience (as well as possibilities for organic traffic). Product descriptions are an opportunity to provide information to visitors regarding your value proposition. Why is the product different? What problem are you currently solving together with your product? Your products descriptions should hit around the unique value proposition of every product inside a obvious and concise way. The copy ought to be informative but to the stage, explaining the precise product features and benefits without counting on industry jargon to speak your message. Tthere shouldn’t be doubt what your clients must do in your product page. What this means is the page requires a obvious road to purchase, beginning having a prominent proactive approach. Your CTA doesn’t have to anything fancy — an easy “add to cart” button can suffice. It ought to, however, be simple to find and employ. Provide your CTA on the prominent location in your product page, and employ contrast to really make it obvious against other elements of design in your page, like the background imagery. Finally, make certain it’s working prior to going live! You may also give a confirmation, for example “[product] continues to be put into your cart!”, to allow customers know they’ve effectively completed the experience they would like to take. Say you’re searching for any new vehicle. You discover two which have each of the features you’re searching for, but there’s one primary difference. You have a lot of reviews — some positive, some negative — and yet another doesn’t have reviews. Can you buy the one which doesn’t have feedback from customers? Most likely not. Testimonials are crucial for creating trust with potential customers — especially online. Inside a survey conducted by eMarketer, 80.7% of respondents mentioned product critiques were either essential or somewhat vital that you their decision of if you should buy the product. This best practice goes for both — you don’t only wish to feature reviews in your product page, but it’s also wise to offer a good way for the people to leave reviews for the products. Shopping online could be nerve-wracking particularly if you’re unfamiliar with a brandname. Online fraud is really a major problem, meaning being an e-commerce business, the onus is for you to determine trust and credibility together with your customers. Displaying trust badges (a seal the verifies a website is legitimate) is a straightforward method to boost confidence together with your visitors that you’re a genuine business and therefore are taking precautionary measures to have their information safe. Trust badge companies collect data in regards to a business, verifying its identity and authenticity and granting it a badge to verify its trustworthiness. There are many badge types that will help convey you’re a reliable business, from security shields to buyer protection shields. To understand more about which trust badges could be suitable for your company and the way to acquire one, see here. Maybe you have found the right product online, only to discover around the last step of checkout you need to pay a leg along with a leg for shipping? If you are like the majority of internet buyers, you most likely abandoned ship. Actually, unpredicted shipping costs was the key reason for site abandonment based on this 2016 study by VWO. Shoppers want complete transparency in their entire shopping online experience — meaning no hidden shipping costs! If you are charging customers for shipping, make sure to display your policy clearly in your product page so that your customers know before they can add their product for their cart that they’ll have to take into account shipping charges when purchasing. This insurance policy pertains to returns, too. If your customer isn’t 100% offered in your product, they’re likely to need to know just how lengthy they need to give it a try before it must be back with you. Could it be fourteen days? An entire month? Are returns free? Spell it in your product pages so visitors don’t need to go looking for the data. Page load time is a big element in site abandonment. You’ll have a terrifically-designed product page with beautiful images, great product descriptions, and killer reviews… however, if the page takes forever to load, it will not matter a little. Consumers have become to anticipate almost immediate page strain on websites. Based on Kissmetrics, 79% of internet shoppers who have a problem with a site’s performance won’t go back to shop there again, and 1 / 2 of internet users expect pages to load in 2 seconds or fewer. Your page speed can have a number of things, like a complex web site design, your server response time, large images and files, large pages, etc. To check on your page speed and identify possibilities for optimization, use Google’s PageSpeed Insights tool. By 2020, mobile e-commerce is forecasted to create up 45% of america e-commerce market. Shoppers are spending increasingly more time on their own cellular devices, so your website must be enhanced for mobile encounters. An excellent mobile e-commerce page features product images that are simple to see and explore, quick page load, along with a seamless mobile checkout experience. Since you have the very best practices lower for the product page, it’s time for you to dive a little much deeper. A stick out product page can produce a massive difference inside your site’s rate of conversion if done properly. Listed here are a couple of tips and methods to make certain you’re getting the most from your products pages. Creating a feeling of emergency could be a terrific way to improve conversions in your site. Using the scarcity principle in your product pages, you develop a feeling of emergency for the website visitors and eliminate time they might spend mulling of if you should purchase. If something is selling out rapidly, customers might be more prone to visit it before time expires. Bear in mind that the product page needs to follow general guidelines to operate. Departing a note like “only 3 left!” on the product page that’s poorly designed, slow to load, and doesn’t feature great product images isn’t likely to strengthen your conversions. Amazon . com uses scarcity principle frequently, particularly when they’re offering deals on select products. Because of so many options online, it’s your decision to supply all the information your clients need to comprehend the need for your product or service and just what enables you to much better than your competitors. Among the simplest ways to get this done on the product page would be to leverage information out of your FAQ page to reply to common questions regarding your product or service and take away any remaining doubt when you are transparent and detailed together with your product information (without completely overwhelming your products page with sentences of knowledge). Should there be common questions across all products, you are able to pull information out of your FAQ page and have it underneath the fold in your product page. You may also link straight to your FAQ page out of your product page to provide obvious direction on where users might opt for solutions to common questions. Under Armour requires a unique method of this by providing a “Questions” area at the end of the product pages that highlight product-specific questions and solutions, as well as allow shoppers to submit questions. If you are offering discounts, sales, or lower-than-list prices, display it in public on your products page. Besides this show internet buyers your value proposition — additionally, it causes it to be so that your visitors do not have to depart your website to check prices. Wayfair is a superb illustration of an e-commerce site who this well. Furthermore they reveal a reduced price… they reveal customers just how much they’re saving using the reduced add up to fully show the worth save. Mix-selling products with related product recommendations could be a terrific way to increase overall cart value, but using personalized product recommendations could be a game-changer. Personalized product recommendations use actual user behavior to recommend items that are often viewed, visited, and purchased together. You’ve probably seen this on Amazon . com, that has been awing customers for a long time using their highly personalized product recommendations. Rather of recommending standard products overall (which may be unrelated as to the your customer is actually trying to find), personalized product recommendations help make your shop seem like it’s produced only for the consumer, since it shows products they’re apt to be thinking about. Your products pages are perhaps probably the most pages in your e-commerce website. From your images for your descriptions can produce a serious effect on a shopper’s decision to buy or abandon ship. To create superior product pages, focus first around the fundamentals. Make certain you’ve high-quality images which include multiple angels of the products along with a zoomed-in character at them also. Also spend time crafting thoughtful descriptions. Keep in mind that users do not have the chance to physically touch and feel your product or service or discover their whereabouts at scale, so depend in your descriptions to supply a full picture of the products. Lastly, keep in mind that transparency is essential. Shoppers need to know everything upfront — shipping, returns, prices, discounts, etc. Make certain to provide them all the information inside a digestible and simply discoverable format. Exactly What Is A Website Design Color Scheme and How Do You Make One? So you’ve made the decision to construct your personal website. You’ve most likely recently been considering color palettes, even when you aren’t quite sure the things they really are or why they’re such an issue. But with regards to designing your website, selecting the correct color scheme is among the most significant website design decisions you’ll make. Color increases brand recognition by 80%, meaning picking your internet design color scheme is important to creating your site not only enjoyable and interesting for your audience, but memorable, too. Before we dive into how to decide on the right color scheme for the site, let’s cover some color basics. Exactly what is a website color scheme? An internet site color scheme may be the mixture of colors your decide for your site’s design. You’ll stay with with such colors during your whole site. Color palettes are utilized to make certain your site colors coordinate. It’s a means of organizing colors that does not only look great together, but work nicely during your site in line with the message you’re looking to get across, the feelings you would like connected together with your brand, and also the action you would like customers to defend myself against your website. Do not know color scheme essential for this site? You realize you would like your website to appear good… along with a color scheme is half the fight for making sure it will. But selecting the best color scheme is all about not only getting a fairly site. Color includes a huge influence over our perceptions, which makes it a effective tool in design arsenal. Color has emotional and mental effects on viewers. Different colors stimulate different feelings, meaning using color strategically in your website can help you communicate the content you need to your clients to get. For instance, let’s go ahead and take color blue. Blue typically makes people feel something is reliable and dependable. Brands using this color within their color scheme include the kind of Chase. I’d say an economic institution would certainly wish to appear trustworthy… wouldn’t you? Color may also affect your general thought of a brandname by influencing the website’s design. When the colors clash, the look looks bad, and visitors obtain a bad impression of the site and business. Let’s take a look at two websites to dive a little much deeper. Website #1 has a lot of information, but clashing colors. The font is a variety of different colors, the backdrop is fuzzy, and also the photos will vary sizes and quality. Can you spend considerable time here? Most likely not. Having a color plan such as this, it’s very easy to have the brand is untrustworthy, unorganized, unprofessional, etc. Should you be buying a service or product directly on the website, you most likely wouldn’t feel too secure by doing this, since the site itself looks unprofessional. You may still find photos, colored backgrounds, as well as different text colors… however it all suits a cohesive color plan, making the company look polished and reliable. Which business can you decide for your water technology needs? That’s the strength of color. Before you choose your internet design color scheme, you must know the actual need for colors and just how they interact together. This really is frequently known as Color Theory. Entire books happen to be discussed Color Theory — so rather to do an in-depth dive, I’ll cover the fundamentals you should know that will help you select a great color plan for the website. If you would like a lot of Color Theory, see here. At its most fundamental level, color theory refers back to the interaction of colours inside a design through contrast, complementation, and vibrancy. Contrast is when you divide elements in your website. Consider it when it comes to black and white… literally. These colors create contrast they completely juxtapose one another. For those who have a black background with white-colored text, your skills is attracted straight to the written text. Contrast likewise helps readability by making certain you are able to really see what’s around the page. Complementation is basically how colors look along with other colors. Complementary colors are complete opposite of one another around the color wheel and supply balance for that eye (more about that inside a bit). Complementation could be a useful gizmo that will help you determine which colors look great together. Vibrancy may be the mood one sets. Vibrant/warm colors are usually more energizing (think reds and yellows), while awesome colors typically make us feel calmer (think blue and eco-friendly). These interactions between and areas of colors are what constitute palettes. Consider the schemes like a blueprint for selecting what colors match. They’re produced by working within color families within the color wheel along with the aspects of color theory. Your color plan is exactly what you utilize to select your color scheme. You will find four common palettes that provide because the foundation of most color palettes. A monochrome color plan relies exclusively on a single base color, and includes different shades and hues of this same color. A complementary color plan uses two colors from opposite sides from the color wheel (complementary colors!). It may use various shades of those colors, but they ought to be inside the original complementary colors. Similar palettes use three colors that sit directly alongside one another around the color wheel, developing a cohesive look through the site but without searching to monotonous. Triadic palettes also employ three colors, however these sit triangular from each other around the color wheel. To produce this plan, choose a base color, then draw an equilateral triangular over the wheel to obtain the other two colors. Now you know the significance of color and just how color palettes are created, it’s time for you to make your own website design color scheme. Listed here are three steps to help you get going. Whichever color plan you select for the website design color scheme, it’s important to begin with basics color. This may be one you’re already using (ex: for the emblem), or perhaps a color that evokes a feeling you desired connected together with your brand (ex: eco-friendly, for growth). Take it easy about shade initially. First, choose a fundamental color like a beginning point. After you have it, use a tool like Paletton to obtain the perfect shade of the primary color, which is your true base color. Now that you’ve got your base color, it’s time to find the color plan for the palette. Basically we discussed the standard four above (monochromatic, complementary, similar, and triadic), there are many other palettes available that you should have fun with. The bottom line is not receiving overwhelmed with options (in order to use a lot of colors). Rather, concentrate on the way you would like your site to become perceived. Would you like to stimulate a sense of tranquility? A similar color plan might be best, since using colors alongside one another around the color wheel creates a feeling of harmony. If you are stuck, you may also use Paletton to obtain an concept of how various palettes works together with your base color, and to find the exact shades that actually work in your selected color plan, which can make your color scheme. After selecting your color plan and taking advantage of it to construct your color scheme, you’re prepared to release it in your site! Bear in mind that the color scheme isn’t only for your background text. You’ll wish to consider another elements of design in your site and just how they tie to your color scheme, much like your photography. Once we saw within our website example earlier, photography could make or break your color plan. Make sure that images you select participate in your general color scheme. If you wish to begin with a picture and make your color scheme from that, read this palette generator by Canva. Again, don’t get paralyzed by choices here. Remember that there is nothing absolute in your site. You might find that once you begin making use of your palette, the hues aren’t quite right. Don’t worry about it — you could use among the tools to tweak your palette before you obtain the style you’re searching for. The most crucial factor would be to just get began! Just how much thought have you put in your Call Us page in your website? If you are like the majority of companies, you most likely centered on the technique (i.e. how people can contact you) but didn’t give much considered to the page itself (i.e. the copywriting and style). The truth is, the Contact page form should be among your most prioritized pages in your site because it’s probably the most visited pages. It is also typically the start of your interactions with prospective customers. Knowing that, let’s talk on how to create a killer Call Us page which will stick out for your visitors. This will go without having to say, but here you go just in situation: it is best to test out your contact page form to make certain it’s completely functional. Try all email and make contact with links, complete any forms, and appearance integrations you might have with exterior databases. If you are running automated responses to make contact with demands, make certain individuals are firing, too. The final factor you would like is perfect for a possible customer to try to achieve you and also never know what you think again. The kind of information you include in your Contact page form is determined by your company. Generally, you need to include details about your operations and the way your customers can make contact with you. Email is excellent and all sorts of, but many of people still choose to call directly. Don’t lose out on an opportunity to interact with any visitors by departing off your telephone number. If you are only open certain days each week, enable your visitors know to provide them a concept of once they should be expecting to make contact with you. Set an expectation of methods lengthy someone should be expecting to hang about until they know what you think. Should you not incorporate a form, make certain you allow people a method to achieve you via email. You shouldn’t limit your audience to just one way of contacting you. Provide your visitors a good way to interact along with you on other mediums by linking for your social networking profiles. Adding your street address for your Contact page form is a terrific way to build trust together with your visitors. For those who have several location, make sure to list contact means of both. However, it isn’t sufficient for the page to achieve the correct information — it must be correctly formatted, too. Your Contact page form hosts your website’s other contact methods, much like your telephone number and address. These components ought to be in readable formats for machines like hearing TTY and visual readers, additionally to marketing tools like Googlebot, which require to crawl your page. Much like a complex FAQ page, Contact pages may become robust for businesses’ which have multiple teams or functions that could require different contact methods. The important thing to the complex page would be to make it simple for that user — meaning organizing the page to make certain these potential customers find precisely what they’re searching for with minimal effort. For those who have various ways for the people to contact you in line with the contact purpose, i.e. Sales, Tech Support Team, Press Queries, etc., organize your primary Call Us page using these groups to be able to help direct these potential customers right contact method. Keep the bases included in including an “Other” or “General” category for individuals who might not determine what they’re searching for within the list. Imagine you’re looking for contact details on the company’s website and can’t locate it anywhere. Would you leave the website in frustration? Don’t permit this to occur to your clients. Your Contact page’s location ought to be foreseeable in line with the action you would like your customer to consider during your website. When the primary reason for your internet site is to possess customers make contact with you, your Call Us page ought to be within the primary navigation. If it is another reason for your website, then your page ought to be someplace foreseeable, as with the footer of the site. The treatment depends on which action you would like your customer to consider. According to that action, you will be able to determine the place for that page — keep it foreseeable. In case your target customer desired to contact you, where are they going to look to do this? Consider someone contacting you like a potential purchase — you shouldn’t do anything whatsoever that may prevent them from finishing the procedure and achieving a person, because that’s money potentially lost for the business. Your Call Us page ought to be obvious and concise, without any barriers for users to obtain stuck on. Keep the copy short and to the stage, and requires to incorporate a obvious proactive approach that informs the customer exactly what you would like these to do around the page. However, don’t think obvious and concise = boring. Exactly what it means is removing something that doesn’t serve a particular purposes, like fluff copy, excess form fields, etc. Your Contact page form can (and really should) be creative without inhibiting a customer from really contacting you. Consider your contact page form being an extension individuals. Its style should reflect your brand, since this is frequently the very first interaction clients are getting along with you. From the design perspective, your Contact page form should participate in the general feel and look of the website. What this means is going beyond slapping a message form on the blank page and calling it each day. Your Contact page form is definitely an chance to provide these potential customers an idea of the items it’s like to talk with you, consider getting creative, both together with your design with your copy. Again, keep the language obvious and concise, but never be afraid to enjoy it. Your page should lure people to complete your form, provide you with a call, shoot an email, etc. — not bore these to tears. Moz: Notice how Moz takes organization to a different level using their search functionality. Although you search the assistance Hub, but you may also consider the Q&A forum to locate solutions for your questions. Below that, Moz has specific areas you will get assist with organized by function. Squarespace: Besides Squarespace organize their contact options and copy obvious and concise, however they get it done inside the minimalist style their platform is really well-noted for. Marble: Having a clean, unique design which includes multiple techniques to contact Marble, this Call Us page sticks out like a obvious illustration of things to follow. Your Contact page form is definitely an chance to begin a discussion with prospective customers or continue engaging with existing ones. What this means is your page ought to be important with regards to your site design and structure. Make certain your design and duplicate are obvious and concise and take away something that might prevent someone from really contacting you (like longer-than-necessary forms, an excessive amount of copy, etc.). Remember to supply valuable business information for the customers in addition to a obvious proactive approach to allow them to make contact with you. Lastly, allow it to be unique! This can be a customer support touchpoint, so your Call Us page should represent your logo and what it’s enjoy to talk with you.